Editors: Penina Kessler Lieber, J.D. and Donald R. Levy, J.D. 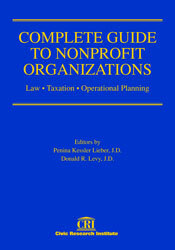 "An important resource for the nonprofit practitioner as well as for the advisors and board members who serve these organizations, the book is written and is accessible for anyone directly or indirectly involved with a nonprofit organization—lawyer and non-lawyer alike. ... an insightful broad-based look at the important issues now facing nonprofits and a forecast of critical changes on the horizon." American charities and tax-exempt groups are expected to meet ever-greater needs, even as their funding sources, operational policies, political advocacy, and grantmaking decisions come under increasing scrutiny. This comprehensive reference provides expert guidance on the full range of decisions involved in structuring and operating a non-profit organization in today’s challenging environment. What is the best organizational structure for a new or growing nonprofit organization? What strict rules apply to private foundations and their grantmaking? What new accountability rules—and sanctions—apply to which types of nonprofits in the wake of the Enron scandal? What employee benefit plan rules apply specifically to nonprofit employers? What state regulations apply to today’s explosive fundraising activity? What are the current rules for faith-based nonprofits that receive government funding? What must charities that make international grants do to comply with post-9/11 antiterrorism regulations? How does the Pension Protection Act of 2006 affect nonprofit organizations?